Bel Respiro, Vista Lieta, Mirasole, and Rondinella: this is neither a nursery rhyme nor a magic formula. These are the names of some of the most beautiful villas that can be found along Corso degli Inglesi in San Remo. They were built between the nineteenth and twentieth centuries and are characterized by their refined elegance surrounded by luxuriant gardens. Since these wonderful houses are privately owned, no visits are allowed. But you can still wander along the avenue to enjoy the unique atmosphere of this unusual scenery – and it is a worthwhile experience. So let’s start with the eclectic style of the 19th century neo-renaissance Villa Bel Respiro, which nowadays houses the Experimental Institute of Floriculture, and then on to No. 470 where you can see Castle Devachan, where the International Conference of the Straits was held in 1920. While Villa Virginia (at No. 452) is a fine example of Liberty architecture, Villa Fiorentina draws back to the Florentine Renaissance and is characterised by stonewalls, a wooden attic, and wrought iron decorations. Moving to eastern San Remo, you should not miss Villa Sirio, Villa Nobel, and Villa Ormond – all found along Corso Felice Cavallotti. Villa Nobel is a Moorish-style building and was home to the famous Swedish scientist Alfred Nobel from 1890 to 1896. It was here that he decided to establish the famous “Nobel prizes”. Nowadays the villa thrives with prestigious cultural initiatives and it houses permanent museum of Nobel relics together with a gallery of Italian Nobel Prizes. Its park is full of age-old and precious plants. Even larger is the wide park of the nearby Villa Ormond which once stretched from the top of the hill down to the sea(although it is now split by the main road). Here you can find fountains, jets, Mediterranean and exotic plants, and a miniature Japanese garden – in homage to the Japanese town of the rising sun Atami, the sister city of San Remo. 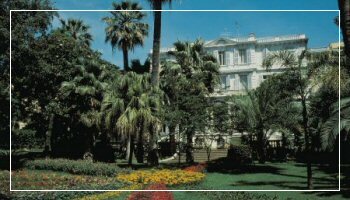 The most luxuriant and peculiar garden in San Remo is parco Marsaglia that once belonged to a famous upper middle class family of San Remo. Here you can find streams, ponds, waterfall, and a cave known as the Franco Alfano auditorium, a spectacular setting with beautiful scenery for summer shows. There are about 2,000 botanical species in San Remo gardens. Still, its most characteristic plant is the palm tree, such as the ones Russian tsarina Maria Alexandrovna donated to the town which can still be seen lining Corso Imperatrice. While walking along this promenade, you can enjoy a lovely view of the sea and the beaches. Here you can also enjoy the relaxing atmosphere of the gardens of Corso Imperatrice, where you can find the lovely Spring Statue by Vincenzo Pasquali that symbolises the mild climate of the town and the monument to Giuseppe Garibaldi by Leonardo Bistolfi. Don’t forget to see BoscoBello park– with its monumental Way of the Cross made by the sculptor Enrico Manfrini; the gardens of Corso Mombello – full of palm trees; the gardens of Piazza Colombo; and finally the gardens of Villa Zirio, Bellevue palace,Villa Ormond, and Villa Nobel.